Expect a mostly acoustic set which will include Turkish influenced music, ballads incorporating lines from Django Reinhardt and Pat Metheny, breezy Latin numbers and blues. A dazzling display of contemporary fare, with soundcspaes ranging from the Middle East, latin America to English pastoralism. Hear this played on nylon string, steel string, electric and acoustic 12 strings, fretless, slide, guitar-synth, glissentar guitars and more! Pete began his musical career in Paris in the mid ‘80s before relocating to the UK in 1997. Shortly afterwards he opened The Spin jazz club in Oxford which in 2012 won the Parliamentary jazz award as ‘The Best Jazz Venue In The UK’. Pete regularly performs with some of the world’s leading jazz artists including Chris Garrick, Gilad Atzmon, Tim Whitehead, Dave O’Higgins, John Etheridge and his own band Curious Paradise. He has now released 14 critically acclaimed CDs featuring his original compositions. 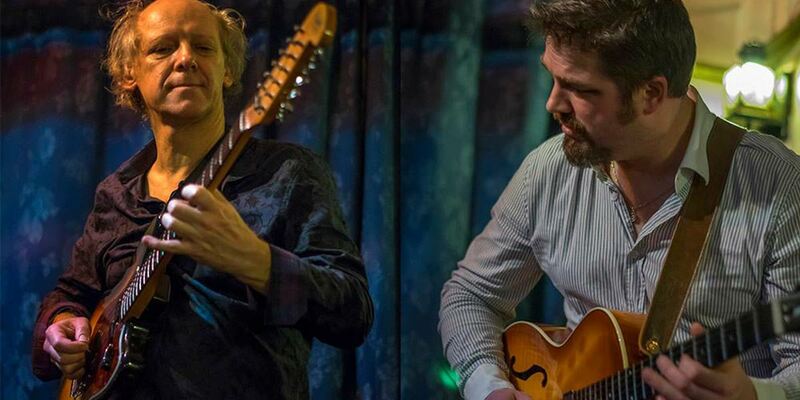 With his unique style that is a blend of Metheny-esque jazz and Turkish inspired world music, Nick has toured extensively around the world with his band the Meier Group, sharing the bill with some of the biggest names in jazz including Bill Evans and Brad Mehldau. This wonderful band (featuring sax maestro Gilad Atzmon) won the overall prize for ‘best band’ at the Juan-les-Pins jazz festival! His recent album Kismet is a wonderful heady mixture of Flamenco, jazz, Latin and Middle Eastern music. His prodigious jazz talent is matched by his other great passion: playing heavy metal guitar in his scorching group ‘Seven7’. Nick was, for the last three years, guitarist in guitar supremo, Jeff Beck’s band, with whom he toured all over the world, performing at major venues and festivals. He has recently recorded a stunning album with the A-lister rhythm section of Jimmy Haslip (Yellowjackets) and Vinnie Coliauta (Sting, Frank Zappa etc. ).